Khalil playing a song on the guitar. Courtesy Khalil via Facebook. Content warning: graphic descriptions of violence. I am introduced to Khalil at a restaurant in the old city of Antalya, Turkey. My Airbnb host, Yunus, graciously made the introduction, after I expressed interest in meeting displaced Syrians, and hearing their stories firsthand. I am in Antalya for three days, with a Munk School of Global Affairs student research group, for the G20 leaders summit in November. While 21 heads of government gather in Turkey, over one million Syrian refugees cling precariously to guest statuses in that same country. As night falls, Yunus takes me to the restaurant where one such young man, Khalil, is working. Khalil is my age, 22 years old. He is tall, skinny, has a thick beard, and a long pony-tail. At the restaurant he is busy, but between cooking, cleaning, and other serving duties, he joins me for conversation. 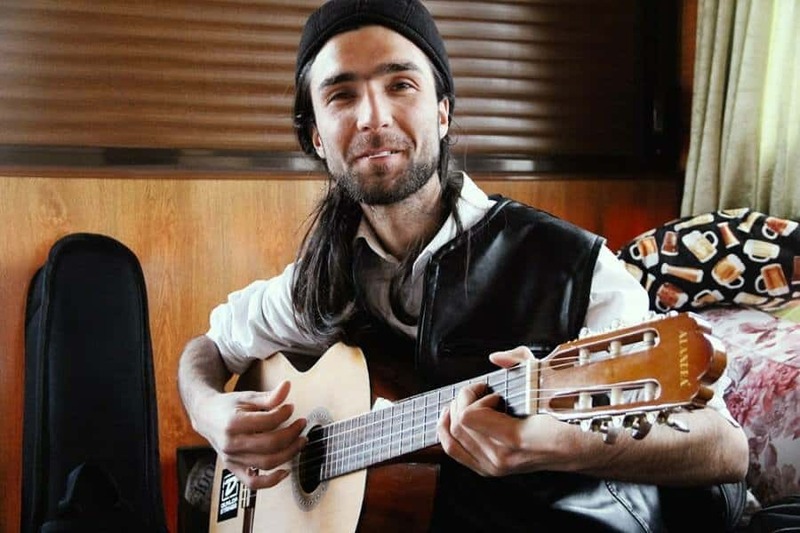 We talk about poetry, music, and his experiences as a stateless Syrian in Turkey. The night progresses and more people enter the restaurant. Our exchanges are cut short, so we decide to meet at a more convenient time. Two days later, I meet Khalil at my Airbnb. He arrives early, with a warm smile and an acoustic guitar strapped to his back. After eating breakfast together, Khalil decides that we will walk to the outskirts of the city where many Syrian families have temporarily settled. While we walk, he says he will share his story. I ask Khalil permission to record the conversation, and if he would prefer to remain anonymous. Laughing, but in a soft voice, he responds, “Well I don’t care. I have read my name on Syrian television. I am already dead.” He cautions me that his description of things may not be wholly accurate and that his memories are both unreliable and biased. For this reason, he says, he will bring me to meet other Syrian refugees — to paint a broader picture. For Khalil, the story begins in a peripheral town on the east side of Damascus, Kafr Batna. At the age of 13, his teacher asked Khalil what he wanted to do when he grew up. “Astronomy is my dream,” was his reply. His response was met with mocking laughter from both his peers and his teacher. According to Khalil, astronomy curriculum is absent from Syrian universities. “This is when I started to hate my government. Because my dream was broken.” Khalil remembers sitting in the back of his classes, surreptitiously practising the application of Newton’s laws to orbital mechanics, while his teacher praised Syrian President Bashar al-Assad. Though Khalil is critical of those who revere Assad, he remains patriotic: “I for sure love my country, but I don’t like my government,” he says. In school, many of his friends were less disillusioned with the Syrian regime. Despite his academic setback and disagreement with friends, normal life continued for some time in Damascus. Khalil studied English instead of astronomy, and in 2012, he received his Baccalaureate. This was also the year that the civil conflict erupted. The Syrian army retreated from Khalil’s town, Kafr Batna, in the east end, and went to the core of Damascus. The army then began to use mortars to shell the east side of the city. “They would shell the normal buildings, the normal people.” Khalil recalls. Fortunately, Khalil passed his exam, received his diploma, and started teaching at a local school. But the promise of progress was short lived. One of his students was killed in the shelling. The attacks grew worse, and the school itself was destroyed; luckily, no one was inside at the time. Even though they were living in constant fear, Khalil and his family remained in the east side of Damascus until the momentous events that took place on the November 6, 2012. By that time, Khalil heard more planes approaching. He describes running towards his house as he heard the whistle of an incoming bomb: “You hear that noise and you feel that you’re not alive. You feel like the shell is coming for you. I can feel it now. The bomb had landed in Khalil’s bedroom. His family, who had been in the living room, were all covered in debris and dust. That same day, Khalil and his nine family members left their town. “That year for me, it was a lot. It was a changing point in my life.” In the year 2012 Khalil received his Baccalaureate, became a teacher, survived war, and fled his country. We had been walking for over an hour by now. It is a walk that Khalil must do everyday because he cannot afford the bus. Seeing a bench across the street, he asks me if I would like to sit down. I have blisters on my feet. I’m relieved that I don’t have to ask for the break that I so badly want. As we sit, I ask him about what happened to his friends from home. Wistfully, he recalls a time when he and his friends would sit around the same table. Now, the war has torn them apart. Khalil describes himself as a pacifist, and failing to join the Syrian army has meant subjection to persecution. Many of his friends made different decisions. Today, two of Khalil’s Syrian friends are fighting for Assad in the Syrian army, while another friend, who is originally Lebanese, joined Al-Nusra — a Syrian branch of Al-Qaeda. According to Khalil, his friends who joined the Syrian Army were granted protection in the Damascus city centre, along with their parents and siblings. Distant relatives and friends of those who joined do not receive protection, and in fact, remain targets. I can see that Khalil is haunted by these memories. He struggles to grasp the decisions of some of his friends back home. “My own view is that everyone who has a weapon has no brain. It’s my opinion. You have no right to kill anybody. This is my philosophy. I believe in freedom and in love and in peace and mercy, and I know in this world there is no love and peace, generally. Khalil acknowledges that he is confused about whether his pacifism has benefited him. Upon turning 18, he refused to join the Syrian Army – a necessary step for acquiring a passport. Without government issued identification, he faced insuperable barriers when applying for refugee status. We finish our break and continue to walk. Soon, we enter the municipality of Kepez, a section of town where many Syrians live. The area is clearly impoverished; garbage lines the street, children run by in ripped and dirty clothing; some homes are simply sheets of metal held together by scraps. We stop by a Syrian grocery store. Its shelves are bare, except for the odd item. A handsome elderly man with white hair and a trim moustache sits outside on plastic chair, while inside in the corner of the store his nine year old son piles sacs of rice neatly on the floor. The family is from Aleppo; they have been here for a year. “All the Syrian people leave for the same reason. All Turkish have been nice. We love the government.” The man is clearly suspicious of me. Khalil tells me he expects the man is lying out of fear. No one in the barber shop wants to speak with me, so Khalil brings me to another house. He thinks the family who lives there will be willing to share their story. We arrive at a house on a side street. A short, portly man greets me with a handshake. He is barefoot, wearing sweatpants and a T-shirt advertising a national park in the United States. I leave my shoes on a pile outside the door and am escorted into the living room. It is a small room with two torn and used couches facing one another. A small Arabic calendar adorns the otherwise bare walls. The man calls for his two sons, both of whom appear to be roughly my age. They are dressed like their father in sweatpants and a T-shirt. The atmosphere is formal. The father sits across from me, in the middle of the couch, while his sons sit at the extremities, one on each end. One son leaves to bring back a Coca-Cola bottle filled with tap water and one glass. A table is placed in front of me, and the glass is filled with water. I feel rude not to drink, but I know that it’s possible I’ll get sick if I do. A pot of Syrian tea is later brought in and I’m happy to drink it instead of the water. The father begins talking about his son on his right, who was kidnapped by ISIS when the group first arrived in Raqqa. Again, Khalil translates his Arabic for me. According to the father, the ISIS abductors were relatively young and were detaining other young men to assess the sentiment of people in the city. These ISIS fighters were interrogating his son in a series of alternatingly friendly and hostile meetings. The son explained that one day ISIS would accuse him of working secretly against them, and the next day they would come with smiles, bearing gifts of money and apologizing for the day before. The father goes on to explain the environment in which ISIS first emerged. What surprised him was the surge in foreign fighters. Many are native speakers of English, Russian, German, and French. Although some came from abroad and knew little about Syria and even less about Islam, they subjected locals to their narrow understanding of what was permitted. I ask how ISIS settled in Raqqa. He responds that it began with the overall conflict with the government. A group of rebels united to form “The Free Syrian Army” — though not “The Free Syrian Army,” he clarifies, that I’m likely familiar with. He says every town has their own group of subversives that call themselves by that name, fdw shared interestes, and they are often in competition with one another. The people of Raqqa, who were treated poorly by the government, welcomed and supported these rebels who promised change. However, as time passed, it became evident that many were simply thieves looking to loot whatever they could. The father concedes that some of these people were in fact good, but that these constituted a very small fraction. Shortly after, Al-Nusra arrived and took over the city. “At first local people were happy because they rid the thugs.” But, just as Raqqa’s previous rebel group soured, Al-Nusra turned against the civilian population. The father continues, telling me how ISIS arrived and ultimately took control. The most radical of Al-Nusra joined ISIS. But, he says, ISIS is not solely comprised of extreme ideologues. Many joined out of fear for their lives or because ISIS pays higher wages than any other military organization in the country. I ask the father and his sons why they left, aware of how self-evident the answer must be. I ask him if Turkey and its people have been welcoming. “Turkey is good, but it is hard to live [here],” he says, “You cannot go to the hospital or schools in Antalya, especially for the Syrian people. The father smiles and tells me that, “these are the bad points of the Syrian people.” I smile back and tell him I’m finished. Khalil goes to the washroom, and the father shows him the way. As I sit with the two sons I try to make eye contact with them, but they seem reluctant. Khalil and the father return, breaking a moment of pensive reflection. I thank the family for the tea and their story. We shake hands; Khalil and I leave. It’s lunch time now, and Khalil and I eat at a Syrian restaurant not far from the family’s house. As we wait for our food, Khalil pulls out his guitar and plays “Tequila Sunrise” by The Eagles. I find the tune warming, but the faces of children and adults surrounding us express embarrassment and ridicule. Perhaps it’s because he’s singing in English. I don’t know. We eat, then part ways. Having spent this much time together, it’s hard to imagine how different our lives will be. The following morning, I find a Facebook message in my inbox. Khalil was fired from the restaurant where he was working, for having spoken with me. Ironically, I receive this information as I am boarding a plane for Canada to return to university — a privilege Khalil, and many others in his circumstance, may never have.